Have you ever been to a Welsh restaurant, in London? Under the fatal chasm of British food, Welsh cuisine is so often overlooked: a shame given the excellent readily available produce. In the new One Tower Bridge development, Pembrokeshire-born Tom Simmons’ eponymous restaurant isn’t so much a Welsh restaurant (there are absolutely no gimmicks here), but has a prominent focus on produce sourced from Wales. The first restaurant to open in the new One Tower Bridge development, the family-run space is operated by Masterchef: The Professionals quarter-finalist Tom Simmons and his girlfriend Lois Thomas, who runs front of house. Inside, the glass-fronted, cubic space is set over two floors. While the décor remains somewhat uncharacteristic, it’s clear that the food served is the main talking point, without need for any unnecessary, garish distractions. As an introductory course, battered and deep-fried nuggets of ‘cockle popcorn’ came with laverbread (seaweed) mayonnaise – an ingredient seldom seen in London. Simple, but delicious, with the salt hit from the laverbread compensating for some of the cockles’ flavour lost in the fryer. 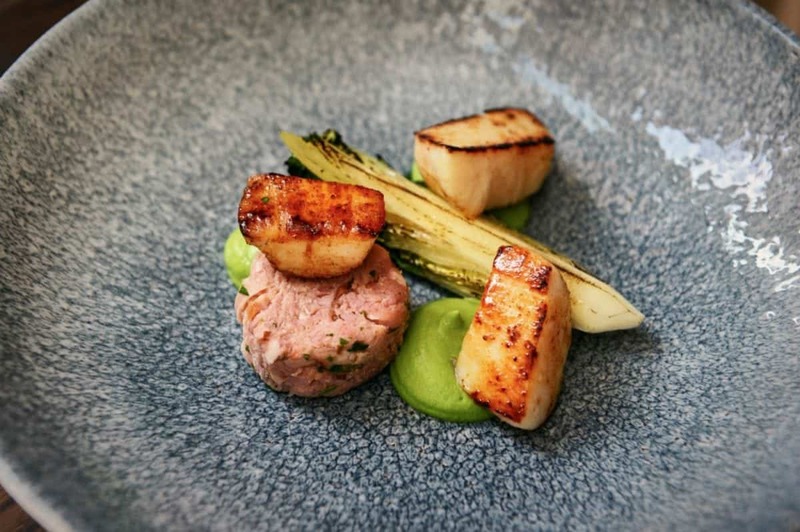 It is a dish with all the necessary components to become a must-try across London. Mushroom croquettes were also deep-fried, comprising a filling of deep, earthy mushrooms with umami clout, complete with a dollop of parmesan aioli. To start, proper, chicken liver and lardo terrine had coarse, gamey flavour, as it should, and arrived at the correct temperature with a slice of brioche and quenelle of port and shallot chutney. Do save some of the remarkable whipped leek butter, served with pre-meal bread, to enjoy alongside the terrine. Orkney scallops (from Scotland), on the other hand, were heavily charred on the outside, but without being overcooked. Elsewhere, the roasted hazelnuts brought texture, while hunks of smoked ham hock provided a constant reminder that scallops and pig are always best of friends. Tom Simmons Tower Bridge’s short rib of beef. 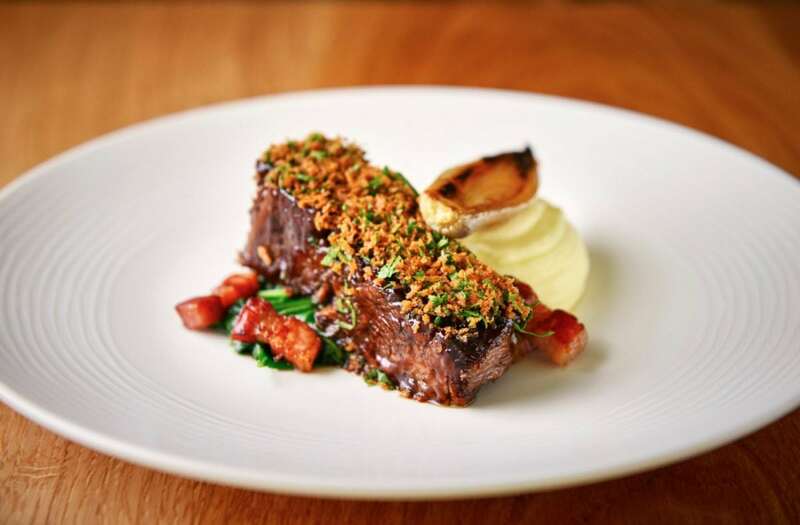 Using one of the cow’s most delicious cuts, short rib of beef had been slow cooked to submission, melting on the tongue but replete with flavour. Complementing the softness of the beef, pommes puree (or mashed potato as we know and love in Britain) was whipped with enough cream to sate Albert Roux, complete with smoky bacon lardons and the sweetest baby onions on this side of France. Although cooked medium-rare as ordered, the lamb rump – Welsh, of course – was served with salsa verde, creamed aubergine and lamb jus. With just the salsa verde and Middle Eastern-style aubergine, like baba ghanoush, the lamb would have been sensational, though the lamb jus with its gravy richness seemed bizarrely unwelcome. With the cooking skill demonstrated, no less, this mishap may be attested to mere teething problems, I’m sure. By all accounts, the lamb dish on the menu has now been changed. To finish, rum baba was less insalubriously saporous and decadent with rum than desired, yet still enjoyable. Warm chocolate mousse, however, was another example of simple cookery exceptionally executed. Ludicrously rich with the taste of raw chocolate cake batter, Tom Simmons humble mousse delivers everything that a chocolate dessert should. Overlooking expected small teething problems, the food served at Tom Simmons’ first restaurant isn’t merely good, it is commendably bold – anchored by inoffensive patriotic spirit. Though the cooking isn’t exclusively Welsh, Tom Simmons Tower Bridge is a fine introduction to the establishment exciting Welsh food (and produce) in London. Tom Simmons Tower Bridge can be found at 2 Still Walk, London, SE1 2RA. Next PostLondon restaurant serves World’s hottest cocktail – would you try it?